Rona and Phil welcome you to their small sea front quality bed and breakfast. We have a ground floor four poster double room, 2 single rooms and a luxury sea view double with a super king size bed. 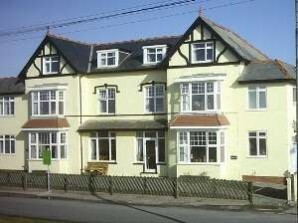 YHA Borth is a comfortable Edwardian house overlooking the beach in the sea-side village of Borth. It's an ideal base for a family holiday as there is a large, sandy beach just 20 metres away. And just 8 miles from the University town of Aberystwyth with direct rail and bus links. Spend Winter at YHA Borth and enjoy bed and breakfast for less! Enjoy traditional Welsh farmhouse charm with the comfort and luxury of modern living in our Aberleri Seaside Cottages, located just a few minutes walk away from one of the sandiest award winning beaches on Cardigan Bay. Based on a 19th century farmhouse and its outbuildings, the cottages are superbly appointed throughout. Something Special available in 2012 For families who like self-catering. Prime position on the cliff - superb panoramic views. Completely renovated to 5 Star Wales Tourist Board Standards. Sleeping up to 8 or 10 people in style and comfort. Llety Ceiro Guesthouse. Lôn Ceiro, SY24 5AB. Llety Ceiro offers 10 comfortable en suite rooms, each of which is equipped with all you may need for a relaxing and memorable stay. It also features space for your private functions, a fully licensed bar and a stylish new restaurant serving traditional home-cooked meals. Holiday house to let in a prime location on the sea side in Borth. Stunning views. Located on the beach and on the Heritage Coastal Path. Close to Ynyshir Nature Reserve. 7 miles from the University town of Aberystwyth. Holiday lets all year round. Edgeley is a three bedroom double glazed, centrally heated bungalow with patio and barbecue plus a lawned area at the back, both of which are gated for safety. It has recently been modernised to a very high standard. It is located on Ffordd y Fulfran, in the cliff area of Upper Borth. It is five minutes from the beach and shops and only 6 miles from the university town of Aberystwyth. There is a large garage and extra parking in the driveway. Holiday lets are available throughout the year. An elegant grade II listed Georgian Country Guest House. Situated in the picturesque Dyfi valley next to RSPB Ynyshir, the home of BBC Springwatch and nearby Dyfi Osprey Project, a short drive from Borth, midway between Aberystwyth and Machynlleth. Ideally located to explore the Welsh countryside and coast. Comfortable bed and breakfast accommodation, from which to enjoy a holiday, short break, weekend away or visit to North or Mid Wales. There are thirteen comfortable, fully equipped caravans and two spacious timber chalets, both of which have panoramic views of Cardigan Bay. 2014 Price list now available, book early to avoid disappointment. 2 minutes walk from Borth/Ynyslas Beach. Sleeps six (1 Double, 2 x Bunk Twins), one shower room. Open plan lounge/kitchen/dining area and Conservatory leading to outside area with bbq and seating. More than just a B and B. It’s a home away from home. Beautiful scenery lots to do locally for a small community. Located on the sea front in Borth, Wales. There are several rooms available, all with en-suite, including single, double and family rooms. As well as ground floor access.